Well, hold onto your scarecrows! Mohawk has introduced the first bio-based fiber that’s made partially from corn sugar. 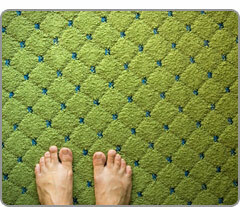 SmartStrand, made with DuPont Sorona polymer, represents a breakthrough in carpet fiber technology, producing a superior type of carpet fiber that combines exceptional durability with permanent, engineered in-stain protection that won’t wash or wear off, while, at the same time, offering environmental benefits such a reduction in energy consumption and greenhouse gas emissions vs. petroleum-based carpet fiber. I’ve heard that carpets get dirty faster after cleaning, is that true? What is hot water steam cleaning and aren’t all steam cleaners the same?